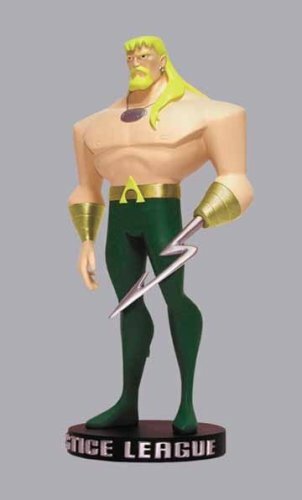 DC Direct's JUSTICE LEAGUE ANIMATED MAQUETTE series has been flying off the shelves, so to assist maintain up with popular demand we introduce a special eighth member towards the line-up! 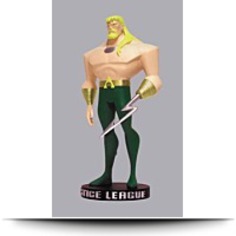 The AQUAMAN maquette, sculpted by John G. Mathews, stands around 9"high x 4. Featuring the super heroes as they seem in the exciting new WB animated series on the Cartoon Network, these statues are depending on models created for the series as the definitive models on which to base their drawings and merchandise. Packaged inside a 4-color box. The brooding King of the Seven Seas joins teammates Superman, Batman, Wonder Woman, The Flash, Martian Manhunter, Green Lantern, and Hawkgirl. 25"wide x 4"deep. Package: Height: 5.5" Length: 11.5" Width: 6.5"